“Aging in place” refers to the decision to live at the home of your choice as you age. Aging in place recognizes that physical functions decline with age and certain tasks – such as climbing stairs, bending and lifting – become more challenging. Aging in place in your long-term residence may not be right for you, as it is not appropriate for everyone. 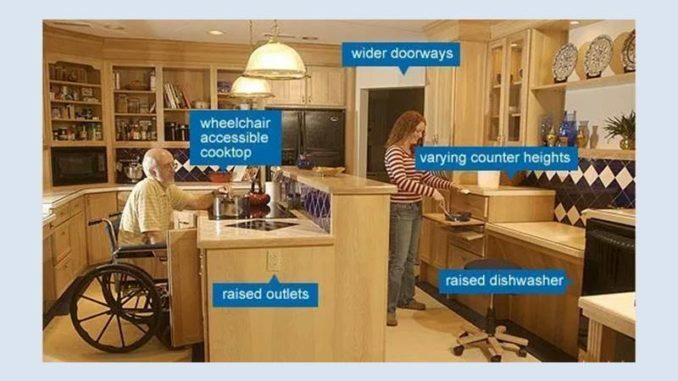 To age in place, one may need to make changes to a home to enhance its safety and convenience. This may esntail modifications to accommodate needs as circumstances change. Financial Considerations: Modifications to a home to accommodate the needs of an older adult living in their own residence and services to lessen burden of home ownership should be considered. Changes may be minor – such as $2,000 to equip the bathroom with grab bars, add a shower bench and adjust the shower entry. Or, changes could be more substantial, such as renovations to widen doorways for wheelchair access or create a first-floor master suite, and could add up to hundreds of thousands of dollars. Another option may be to bring in care to the home. The national median annual rate in 2015 for homemaker services or home health services was $45,760, based on a $20 national median hourly rate multiplied by 44 hours per week and 52 weeks. Family Considerations: If family members live in the area, it may be possible for them to assist with transportation to medical appointments and running errands. However, some people find that family members are either not always available or have other responsibilities like work or family. Placing additional responsibilities on family members is something that needs to be proactively discussed. If you do not reside near family members, how would you get around if you were to lose the ability to drive? You may become isolated, which could lead to loneliness and depression. Lifestyle Considerations: Driving and transportation are important factors for ensuring the success of aging in place. Many simple household tasks can be handled by service providers. Arrangements for shoveling snow, handyman tasks, preparing meals and housekeeping can be made as needed. Healthcare Considerations: Healthy residents who can drive or who have transportation can keep up with regular doctor visits. As you get older, you can bring in home healthcare services to provide assistance with medical and non-medical care.